LES CARTES PORTOLANES: A CRITICAL ANALYSIS OF THE TECHNICAL SECTIONS, WINDS AND DRAUGHTSMANSHIP USING THE ORIGINAL TEXT ORDER AS THE DETERMINANT. Within his text concerning the Carta Pisana, R J Pujades in a very self critical manner corrected his opinion of the date for the chart. He commented he had taken the original research as correct and just accepted it. On the other hand J Alves Gaspar commented that after 200 years of research there was no agreement concerning the charts. But, the fundamental flaw in their basic research was that neither of them, nor one researcher had taken the charts in their logical date order and endeavoured to redraw the basic forma and information; both their background and foregrounds to establish the fundamentals. It is a fallacy to suppose that a chart can be analysed by observation only, the draughtsmanship must be attempted to prove the theoretical stance of the researcher. Thus by using the text of Les Cartes Portolanes, pages 473 – 481 and 513/514, paragraph by paragraph, and inserting research carried out on individual charts a new and technically correct theory appears. Within paragraphs 1 and 2, R J Pujades discusses the drawing of the Wind network and his arguments posited regard it as being drawn ‘before’ or ‘after’ the coastline and the writing of the toponyms. R J Pujades immediately uses Kretschmer’s argument, endorsing his hypothesis that ‘the wind network served as the basis on which to construct charts collides head on with the fact that the centre of the network on the chart never coincides exactly with that on another, even when both were the work of the same cartographer’. This raises a very important point which R J Pujades discusses in his text, paragraph 12, the charts diaphragm. Thus we must jump ahead and return later to the paragraph order. Paragraph13; ”As the reader will have noticed, there are groups of up to fifteen or so works in which the horizontal axis passes approximately through the same places. If to this we add that in several cases a number of groups that have been counted up separately might be regarded as variants of the same model, given the minimum degree of variance at one of the ends, the conclusion we draw is that it is unlikely that such close coincidence is a chance occurrence. Furthermore, it is a striking fact that works forming part of the same group are by the same cartographer and by cartographers linked by master-pupil relationships; on the other hand, it is not so surprising that there are also works by the same author in which the line running through the middle of the circle passes through points at quite a distance from each other, because there may be a number of reasons for this, ranging from the use of different models in different works to adoption of another of the lines in the system as the basic reference point (as the result of the extension or reduction of the peripheral geographical area represented). COMMENT; if the charts numbers C1 to C41 are studied a very different picture emerges. Instead of focussing upon the latitudinal diaphragm, that is east/west at the centre of the wind rose, the focus should shift to the longitudinal centre line, which is North/South; then an entirely different and more accurate picture will emerge (diagram ChlCpD02 and ChlCpD03). Firstly we must bear in mind not all charts cover the whole Mediterranean basin from Iberia to the Black Sea, 10W to 42E geographical longitude. Thus tabulating the longitudinal centre lines will produce anomalies, based upon the longitudinal spread of the chart. Following this simple exercise we firstly assess the geographical centre lines as diagram ChlCpD02 illustrates. There are two possibilities, firstly the overall longitude from Iberia to the eastern Black Sea, 10W to 42E, giving a centre line of 16E longitude, or secondly from the Pillars of Hercules to the Gulf of Issus, 6W/5W to 35E/36E with a centre line of 15E longitude, Sicily. We can thus observe from the list above that from 22 charts noted the centre longitude varies from 14E to 19E on 10 charts with a further 7 charts being part Mediterranean sea only and having a centre line varying from 9E to 12E. Therefore the latitudinal positioning of the chart upon the wind rose graticule will vary for just one single reason, its slewing magnitude, and that is in fact irrelevant to how the chart is set out latitudinally as it does not appear as a known feature or alignment. 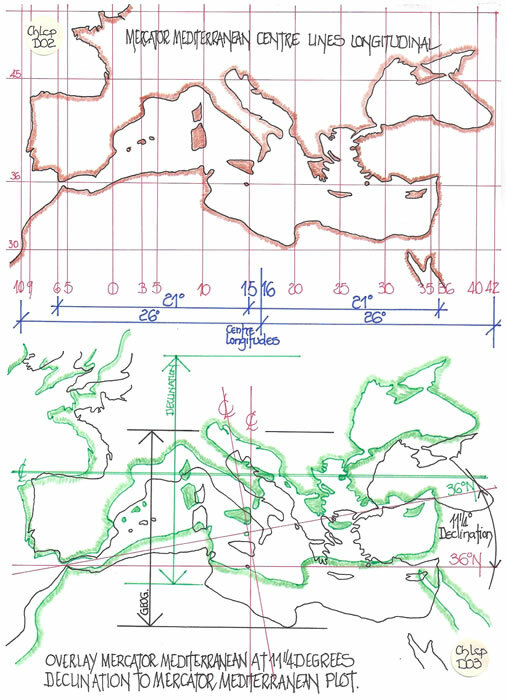 Thus when the background graticule of the wind rose is drawn the longitudinal centre line is used to position the chart template(s) such that the longitudinal spread is accommodated centrally, that being far more important than the latitudinal spread, particularly in the southern areas of the map. 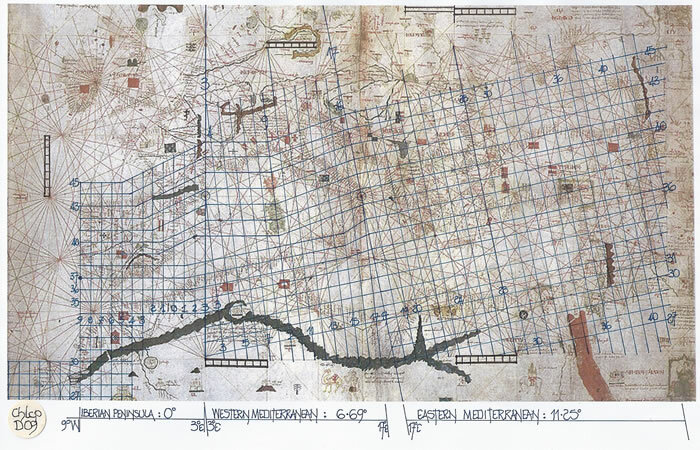 ““Solid evidence of the importance the first cartographers attached to drafting the network of directions as one of their professional skills is the double page featuring the design of an independent wind network that figures in Pietro Vesconte’s atlas now preserved at Lyon. This example may not in any way be regarded as a page prepared for a chart that was never drawn, neither because it appears before all the charts the atlas contains nor because there is no empty space on the geographical surface represented in that work. It is an instrument deliberately intended to reveal to the future owner of the work the nature and characteristics of the wind network he would find at the basis of all the charts on the following pages, while at the same time constituting a kind of exhibition of Vesconte’s professional mastery over this fundamental aspect of the art of cartographic production. This is ratified by what is probably his self portrait as a cartographer in a corner of the atlas preserved at the Museo Correr (port.28), in view of the fact that the sheet he is holding features part of a wind network”. In the English section page 473, The Wind Network, Pujades states,” The theory of the use of a grid pattern as the basis for the construction of the charts is certainly not a new one, though it has been most convincingly championed by Lanman, who stresses the fact that beneath the wind network on all charts lies a grid pattern, and that this, established before the coastline was drawn, served as the guideline for the configuration of charts. However, although Lanman insists that all wind networks conceal a regular grid pattern consisting of four squares (eight in the case of charts featuring a double circle, obviously), it is not this simple grid but a considerably more complex one, as we have seen, that seems to constitute the first stage in the production process of charts, or at least of some of them”. Having fully researched J T Lanman’s paper it is hard to accept R J Pujades comments as he quotes pages 33-48 where-in J T Lanman does not discuss the background grid in terms of the winds. Thus it is necessary to set down facts that can be ascertained from the diagram. Firstly, there is no pin hole for a compass point and no circle has been scribed. Secondly, the scale in the top left corner, NW, (that is when the chart is oriented north at the top) indicates the reasoning. Why is a scale required for a wind rose? It is set precisely in a square with the NSEW points located there-on, thus the overall dimension is assured. Thirdly, after drawing the two major lines forming the cross, simple measurements using the scale bar can now be made and the underlying graticule of the wind rose drawn. The measurements are a set of ratios formed by the 22.5 degree winds and are 35/30/20/7 and can be sized to suit any vellum sheet. Thus the 16 winds are located, although Petrus Vesconte only initials the main four, NSEW and the mid quadrant winds, thus 8 in total. 1) The external square is drawn first and the NSEW cruciform added. The square has a size which if checked against the inner alignment would measure 184 units, i.e. 92 +92 per quadrant determined by the trignometrical ratio of the 22 ½ degree segments. 2) Quadrants are then marked off from the centre point in measured ratio, 35/30/27, total 92, although in fact it would be 35/30/20/7 if all lines were required to be drawn. The outer division line which would denote the 67 ½ degree wind is omitted, the scale bar indicates it. 3) First the inner square is drawn joining the cardinal points and the 45 degree lines are drawn, but as can be seen avoid the scale bar. 5) The squares formed by those marked 22 ½ degree points are then drawn. At this point in the exercise there are four major squares including the outer frame. 6) All points and major lines can now be drawn denoted by their colour code, red green and black. It has already been pointed out but must now be emphasized that at no time has a pair of compasses or dividers been necessary in the constructional drawing of the wind rose. It is line geometry of square, rectangle and triangle which has been used and this fully accords with the text by Ramon Lull, to be explained later, but beautifully illustrated by Petrus Vesconte. At this point in the analysis of R J Pujades text it is worth noting research carried out upon the PetrusVesconte 1311 Portolan Chart (p72/73) (diagram ChlCpD07) and the Angelino Dulceto 1330 Portolan (p114/115) (diagram ChlCpD08) and his 1339 Portolan (p120/121) (diagram ChlCpD09). 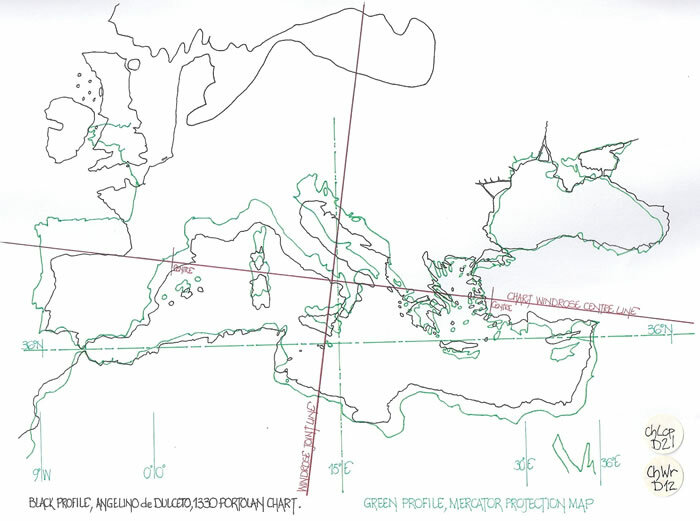 This chart is of the Eastern Mediterranean Sea and Black Sea, geographically 8E to 42E with a longitudinal centre line at c25E confirmed by its passing through Crete. The wind rose is actually predicated in the west by Rome (12.5E) and Gireson on the northern Anatolian coastline of the Black Sea at 38.8E. Thus the wind rose is 26 degrees longitude and latitudinally from 30N to 47N with a slewing of the 36N latitude by 11.25 degrees, one quarter wind. The graticule is determined by the scale bars with the central squares 35 x 35, 35 x 30 & 35 x 27, i.e. 35/30/27 ratio. But in the west where the 27 ratio pinpoints Rome the graticule extends to a partial line 30 units west and a bordure 42 units (6 x 7) west of Rome. Thus the bordure is 92 + 92 + 42 units = 226 units east/west and 92 + 92 = 184 units N/S. 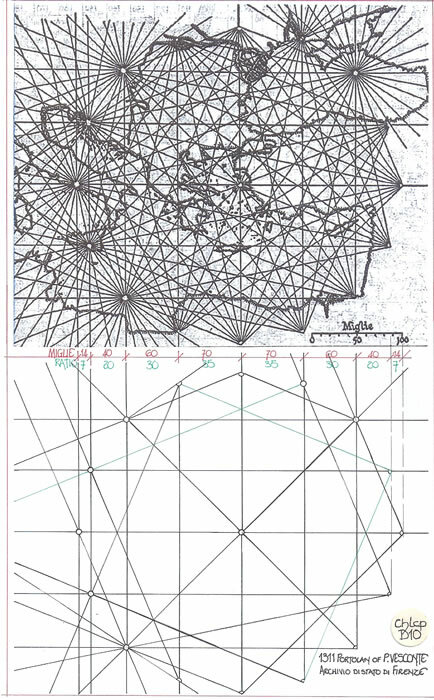 Having shown that the two cruciform scales are in fact the arbiters of the wind rose construction we can assess the measurements of the Portolan; Djerba to El Arisch = 2200Km and is 167 units of scale; that is 1 unit = 13.7Km or 8.066 Toscane Miglia of 1.633Km and is thus 2 leagues of 4 Miglia. Thus the proportional grid has a probable measurement of 35 x 8 = 280 miglia or 70 leagues and then 30 x 8 = 240 miglia or 60 leagues and 27 x 8 = 216 miglia or 54 leagues. These are but twice the 35/30/27 ratio units of the graticule. This is as can be readily observed the simplest method of all to set out the wind rose graticule and the chart, one measurement for both. A most striking feature of this chart is that Dulceto has used a motif for each cardinal point, and written both the Geographical name and Wind name against all cardinal points as if to reinforce the fact that he is fully aware of the true or geographical NSEW and that the actual chart map is slewed to suit a nebulous deviation. There are two wind roses upon the chart and five scale bars all set in the same wind rose squares when measured. The chart has a nebulous western boundary but the eastern is fairly represented by the Black Sea, 42E longitude. The chart has Ireland drawn and accords with the 10W longitude which is generally a chart boundary in the west with Iberia at 9W. The chart centre line is 15E, Sicily, which indicates a 27 degrees East limit and as shown is 25W + 27E, 520 spread. The wind rose diagrams are set off centre on the vellum in a N/S direction by a considerable distance to enable the Baltic Sea and Southern Scandinavian coast to be included. Thus using the scale bars, all five, we can measure the graticules and confirm they are 35/30/27 units for each wind rose. But to assist us A Dulceto has included a single line marker for the 67 ½ wind line, exactly two units long as Vesconte used on his 1321 wind rose diagram. The line is situated west of the eastern wind rose centre line. The southern space is 25 units and the two extra northern bands are 35 units each. Thus the overall graticule is 25+92+92+35+35 = 279 units N/S and 4 x 92 = 368 units E/W. Obviously there is vellum to the east and west without any vertical lines, but measuring from the western graticule limit to the centre of the western Ponente marker circle it is 25 units as the southern band and 35 units to the actual scale bar position. 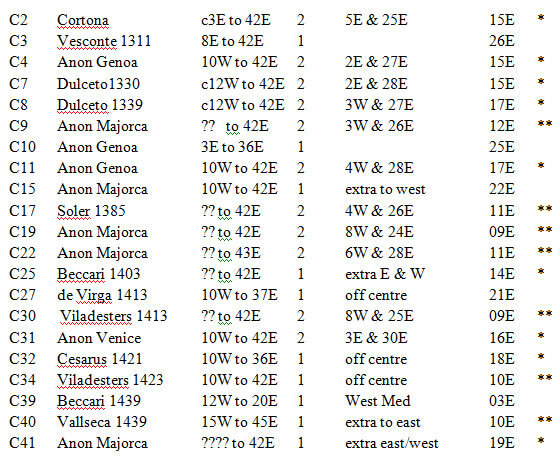 An analysis of the distances indicates that each scale unit of 5 is in fact 10 leagues as per the Vesconte Chart of 1311. 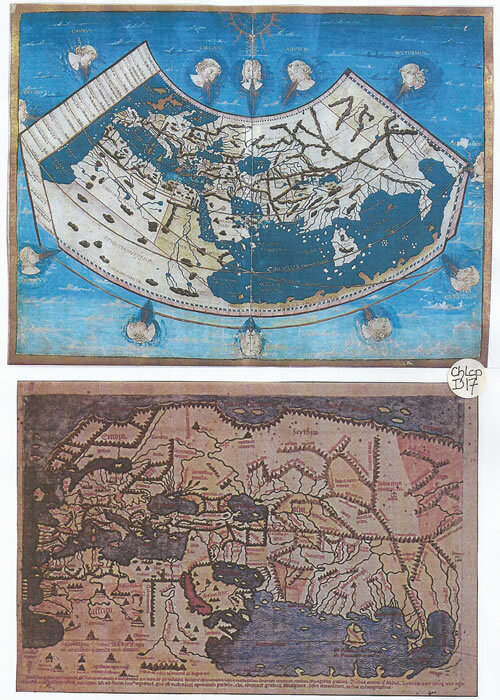 Comment; these two charts plus the 1321 atlas wind rose of Vesconte are probably the oldest extant charts. They indicate quite clearly that the wind rose is set out by a series of ratio units 35/30/27 or 35/30/20/7 which in turn become the measurement device for the chart at 2 leagues or 8 Toscane Miglia per unit. 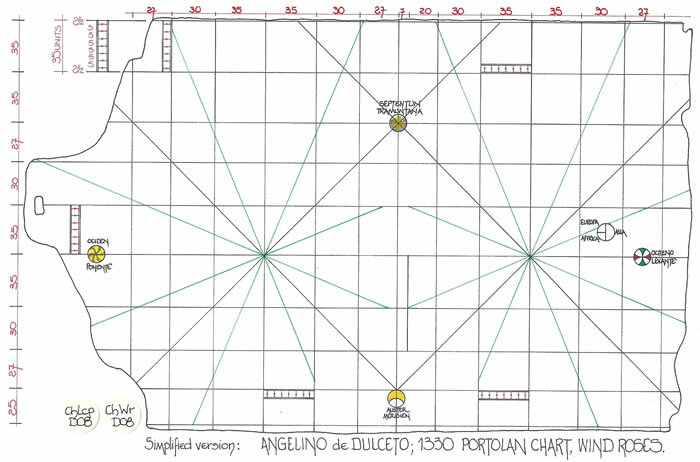 The 1339 Dulceto Chart with the putative geographical graticule is included as diagram ChlCpD09 as an appendix to the text. But most pertinently the scale bar, 0-50-100 Miglie, and the cruciform scales are also the scale bar for the chart confirming the calculations previously made here-in. Thus we can confirm that from Djerba to Al Arish is 325 Miglie or c2200Km and the Miglie is c6.77Km and finally across the foot of Italy toe to heel is 52 Miglie or c350Km and the Miglie is c6.73Km. But the Toscane Miglia is 1.6333Km and hence 4 Miglia is 6.533Km and in all probability the Miglie of Petrus Vesconte is a League of 4 Miglie, called Miglie. Naturally the scale for the actual chart will be twice and thus 8 Miglie, 2 leagues. If there is a graticule which determines the whole chart, in this instance a wind rose graticule, it is obvious it will also be the scale for the whole Portolan. Thus in these very first portolan’s by Petrus Vesconte we see the culmination of geometry in their construction and the use of rectangular alignments for the basic chart. But we also see that the wind rose is always set NSEW and not at a declination. Thus I consider the referee’s comments to show a lack of research knowledge with regard to my text and that the real setting out of a wind rose is via dimensions and not a circle. In 1338 Opicino de Canistris wrote; “In mappa maris navigabilis secundum januenses et maioricences habetur certa taxation passuum per miliaria quae in lateribus huius cartae per quodlibet punctum denotat X miliaria, scilicet in spacio inter punctum et punctum. Deinde, per V spacia ipsa facit unam quadraturam oblongam quae per quinquies X computat L. Quae quadrature p. VII faciunt certam taxacione in longum habentes septies L, idest CCCL miliaria passuum. He also wrote that the “mile in his day was longer than the Roman Mile and that elsewhere the league was used.” The basic measures are; Roman Mile 1.4791Km; Statute Mile 1.6093Km and the Toscane Miglia is 1.633Km. But the text describing the scale bar and allotting 10 miles between points, then 5 spaces for one oblong quadrilateral and then the quadrilateral make sevenfold, is no more than an obscure methodology of describing the wind rose setting out as diagram ChlCpD11 indicates. We have already shown that Petrus Vesconte used his scale bar to indicate the 7 ratio unit and that the main squares are 35 units, that is 5 x 7 = 35 and therefore the “seven times 50 that is 350 miles noted”. Hence not only can we state categorically that the wind rose construct was firstly by measurement, c1311, but in 1338 that methodology was put into words for all practioners of the art of cartography to read and utilise for their charts construct. 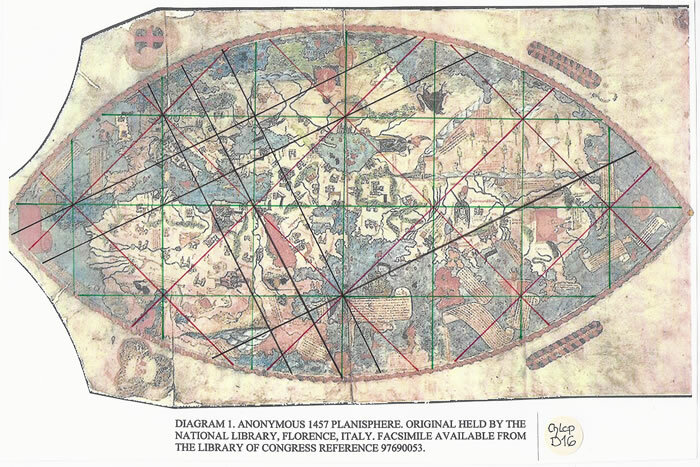 Thus it is possible to opine that the wind rose graticule is the arbiter of the Portolan Chart, it is the charts scale and framework onto which a map is set out longitudinally, but slewed. In paragraphs 9 to 11 R J Pujades discusses the possible usage of the background graticule as a copying tool. This he rejects in paragraph 11, “The conclusion we may draw from this is that, in principle, neither the wind network as a whole nor its simplified version that preceded the process of outlining the coast served as a basis from which to obtain copies”. This is to have completely misunderstood the basis of the graticule and does not negate the use of a grid to copy charts. However it would be a portable grid, a frame with fine strings as a grid such that it could be laid upon the chart or part of the chart to be copied, and as Pujades suggests, “perhaps they used lead or graphite pencils to draw lines of the grid, which they could later erase with soft bread”. My texts ChPo1, ChPo2 and in particular ChPo3 fully detail the simplest method of producing a chart using a template or templates which are traced around (lead, graphite or charcoal, or even light pouncing) and then the coastline is inked in with the traced lines erased as above. Commencing with the fact that there are groups of up to fifteen or so works in which the horizontal axis passes approximately through the same places and others which are wildly variant as already discussed, R J Pujades makes the following statement in paragraph 14. Firstly we must define “correct orientation of the wind directions on the network”. This statement indicates a fundamental misunderstanding by R J Pujades concerning the wind rose as drawn. Study the first extant charts and atlases available, Vesconte 1311 & 1321 and Dulceto 1330 & 1339. They clearly mark the wind rose with NSEW, it is always with the master centre lines N/S & E/W across the chart and the map is always set slewed across these lines indicating a variable latitude and longitude. Thus at no time is the maps form in agreement with the geographical NSEW of the wind rose and hence the wind directions plotted from points upon the slewed map form will not be correct. Returning to R J Pujades text we can now dissect the paragraph by Cotrugli (1464) with the problems discussed illustrated on diagram ChlCpD12. From Porto Petro to Alexandria on a Meridional Points or Mercator projection chart it is a bearing of 110 degrees, i.e. 20 degrees south of east and close to the WNW Maestro/Ponente Wind or from Alexandria ESE, Levante/ Scirocco. But Cotrugli notes the wind as “quarter Scirocco verso Levante” which is South East by East. Even allowing for a mis-copy, Levante Scirocco to Scirocco Levante it can immediately be seen that the directions are a quarter wind or 11.25 degrees off course. Thus his chart is slewed northwards by 11.25 degrees. From Venice to Monopoli, it is 1400 or 500 (South of East) and as such the Scirocco notation at 1350 or 450 (South of East) would be appropriate. But that also indicates that the eastern littoral of the Italian Peninsula has been drawn close to geographical. Cotrugli omits the wind for Tenedos/Cape Malea, a 121.50 alignment, or 32.5 0 west of south and if in fact geographical would be NE by N or Quarta Greco verso Tramonatana. The chart C31 (p210/211) Anon Venice, has a bearing for the alignment of 112.50 and thus the 22.50 wind, NNE or Greco Tramontana would be read from the chart and thus be one quarter wind, 11.250astray. Thus paragraph 15 of R J Pujades text p474 cannot be acceptable. He states, ”The cartographer, therefore, was obliged to make sure that each time he drew a nautical chart on the basis of one of the models, the wind network had to be perfectly oriented in terms of location of the ports on his design of the coastline”. 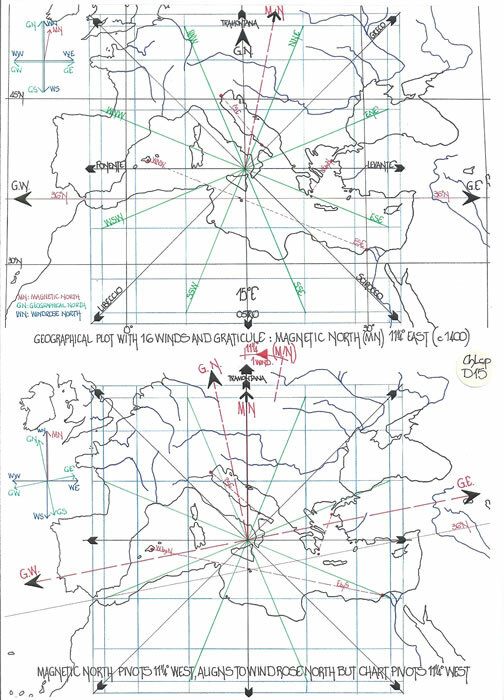 Firstly it has been shown that the wind network is always drawn NSEW, quite correctly, and thus each wind blows from its geographical position as diagram ChlCpD13 illustrates. The wind alignment cannot cope with a declination unless the mariner has a wind rose magnet with fly atop twisted by 11.25 degrees or one quarter wind awry against the true wind positions to obviate any discrepancy. Why would he know to do this and why would he not consider the winds to be from their geographical positions as shown by the charts toponyms? That is because the magnetic north is realigned to Graticular/geographical north of the wind rose and the map within the chart is slewed 11.25 degrees to the east, and thus always one quarter wind awry as diagram ChlCpD14 illustrates. But of course if the magnetic compass is aligned with the wind rose, the Fly atop immediately gives correct sailing directions on the map within the Portolan Chart, but the Wind Rose is then 11 ¼ degrees out of alignment. But how would it operate when it has been clearly shown that there is a wide variety of declination across the chart, with it being geographically correct in places and not others. In other words you have to know that the reading obtained on the chart for a wind from Majorca to Alexandria because of the declination of 11.25 degrees will be one quarter wind awry. If a mariner sailed using Cotrugli’s directions he would land on the Toe of Italy and not bypass Malta (i.e. the winds quoted were from the west not east as he stated) on route for Majorca. (diagram ChlCpD15) Thus it is fair to opine that Cotrugli was looking at a chart and probably making the idea up as he wrote and had no knowledge of the magnetic/geographic complications. Thus his wind route is a magnetic wind not a true wind direction. Having dealt with the wind directions, R J Pujades returns to the axis of the chart, E/W and N/S. Here we read that Pujades is wedded to the circle form of the wind rose as he states; ”Meanwhile, we know for certain that divergences existed as from almost the very beginning in the production process of all works, since once the ‘diaphragm’ had been drawn, the different alternatives were subsequently applied. The first of these was to draw the chart with one single wind network or two interlinked ones or, which amounts to the same thing, on the basis of one circle or two aligned ones. If the chart featured only one network, the point where the central vertical line cut through it became the centre of the delimiting circle. If it featured two, then it became necessary to draw two further vertical lines that cut through the horizontal one at a distance from the central vertical equivalent to the desired radius of the two delimiting circles; in this way, the two points of intersection with the horizontal line became centres of each network. Next the diameters of the circles were established by drawing the two lines parallel to the ‘diaphragm’ and the two lines parallel to the vertical axis to form the squares that would delimit their dimensions. Then the rest of the vertical and horizontal lines were drawn which (and this was not a whim on the part of the cartographer) in many cases reached the edges of the vellum while in others they were confined within certain limits. (see initial Diagram for a single and Double Network on page 199). Unfortunately the initial diagram comprises a square with four quadrants and a circle and is thus totally at odds with the research into the Vesconte and Dulceto charts here-in and requires to be struck from the record as it is a totally false methodology as described. This misrepresents the visual facts. The chart (diagram ChlCpD07) is bounded not by a square but a rectangle which has been curtailed in the NE corner to allow the Black sea and Sea of Azov to overrun the intended bordure. 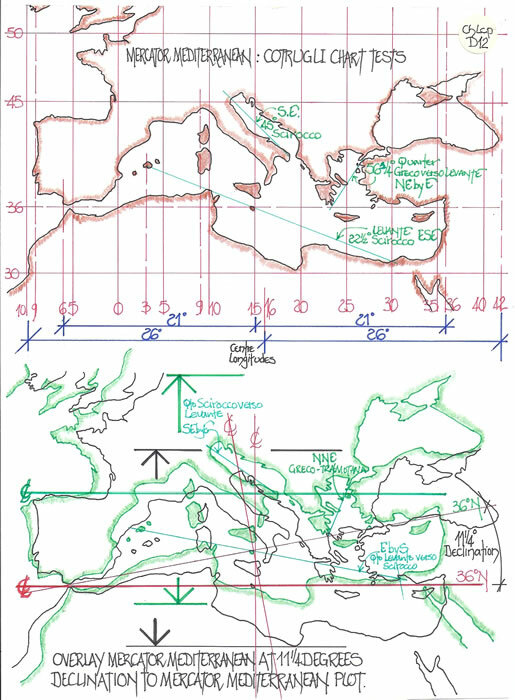 In the east the wind lines stop at their generation points and in the West are carried across the chart to the bordure as a means of completing the drawing to cover Sardinia and Corsica. There has been an attempt to continue the graticule to the west and hence the wind lines naturally follow. But this is ridiculous; if a chart of any size is drawn, a simple wind rose will be more than adequate to ensure the direction of sailing is known. Consider this; you have before you a chart with a multitudinous number of lines criss- crossing the littorals; it is perhaps kept in an area not open to the elements and thus requires to be easily read and understood; easily used to locate a direction; easily used to place a straight edge across the two journey points and establish the route. What better than a simple 16 wind rose (or 32) set on the chart in any position NSEW so that by aligning the journey and transferring that alignment to the wind rose the wind and direction would be obtained. Study the Vesconte 1311 Portolan it is 42 x 52cm that is merely 16.5 x 20.5 inches. The illustration in Les Cartes Portolanes is 71% full scale, a root2 reduction. Firstly, can you read the chart profile of the littoral or can you read the wind lines. Imagine you are in a slightly darkened ‘cabin’ or ‘cockpit’, you require to align a course on this chart. Quite frankly you would be hard put to read the coast profile let alone the toponyms. Thus these charts are in all probability Library editions, the multitude of lines from the wind directions negates their practical visual use at sea. This of course is in agreement with the texts of Piero Falchetta and Patrick Gautier Dalche who consider they were not used at sea. Therefore we should reject the presentation or the charts as illustrated in Les Cartes Portolanes as sailing charts and reject the text of Parry et al where they state the chart is the same for mariners as libraries sans decoration. It is the wind rose which would negate use at sea in poor conditions of light and visibility including its quarter wind deficiency. 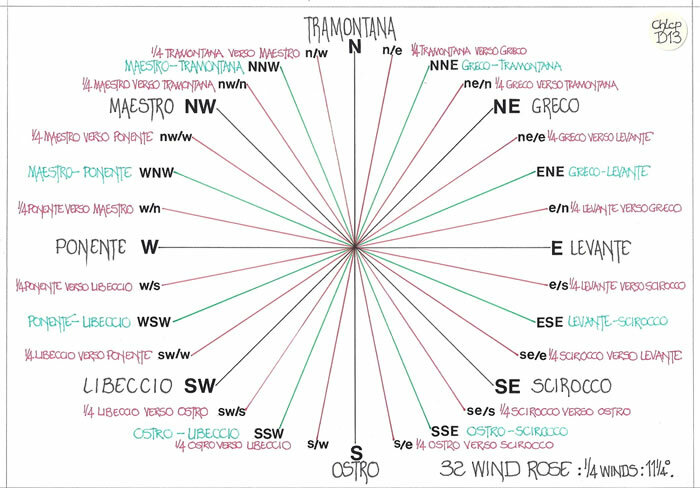 Here we read of the wind rose as it affects the Carta Pisana and the Cortona Charts. Here-in R J Pujades states clearly, ”Indeed the clearly visible circumference is absent from all works by Vesconte”. Thus the first extant charts are drawn without a circle and are thus the originals as far as the wind rose setting out is concerned. If they did not require a circle, the circle is not required in or on any Portolan chart, Q.E.D. It must be quite obvious to all that given the proofs discussed that the graticule is the arbiter of the wind rose, the circle, as has been posited previously is only required to mark out the 7 ratio or 67 ½ degree wind point in each quadrant. Thus it does not require to be drawn fully, with any real mark upon the vellum, merely a mark at the appropriate grid lines either side of the cardinal winds for this final set of points. 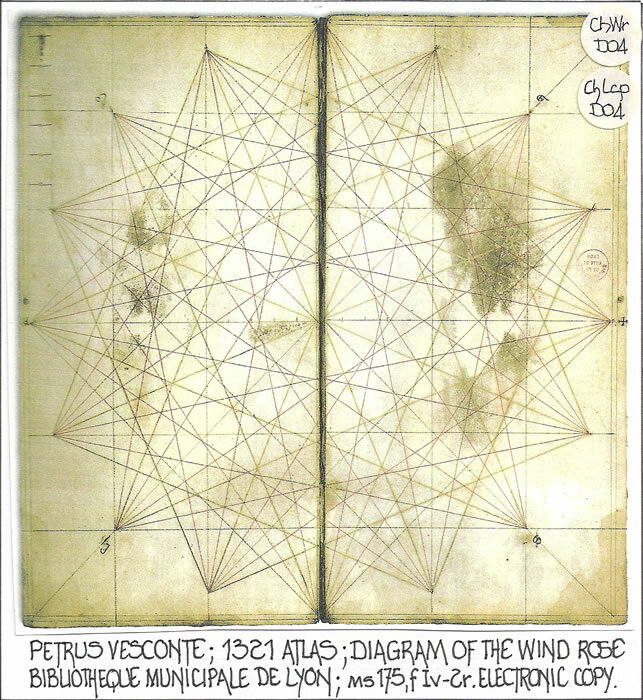 Thus if R J Pujades had actually investigated the 1321 wind rose of Petrus Vesconte, or his 1311 Portolan or even the two Dulceto Portolan’s where-on are the 7 ratio marks, then the majority of his text would have been unnecessary and the correct interpretation provided. This is to completely misinterpret the world map and its draughtsmanship, no doubt as usual borne out of the typical visual appraisal without recourse to examining the actual draughtsmanship of the world map. Firstly the map is encompassed by an ‘almond bordure’ and is similar to the Pirrus de Noha world map (diagram ChlCpD17) drawn at the 1414 conclave of Constance where the clergy spent an inordinate amount of time discussing and having copied the newly translated ‘Geography’ of Claudius Ptolemy. The Pirrus de Noha map is a melding of a Portolan Mediterranean Sea to an oikoumene map of Claudius Ptolemy with the 36N latitude following through from the one to the other as a regulator of both maps, as diagram ChlCpD18 indicates. 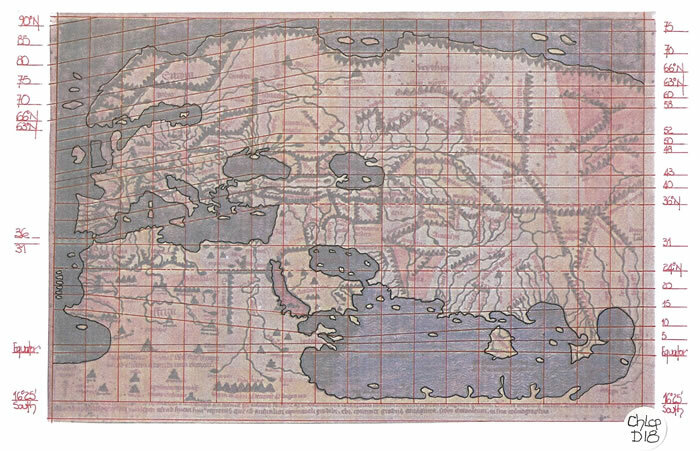 The 1457 map is a similar design, and could be a copy, and thus it is set out to the Ptolemaic principles of the majority of the map. Pirrus de Noha’s map is exactly the same principal. Therefore we can assess the lines drawn upon the 1457 map in Ptolemaic terms (diagram ChlCpD19) and see that the horizontal lines are in fact latitudes with the base line being the Equator, the middle line passes through Alexandria at 31N and the northern line is no doubt the 63N, the limit set by Ptolemy (diagram ChlCpD20). Thus we can accept that these lines are ‘equidistant’ and look at the vertical lines. They are set 31 degrees apart and the second line marks quite perfectly Genoa, 31E according to Ptolemy. Therefore the lines form squares of 31 degrees; they are not a wind rose, they are joined by diagonals which are in fact signifying that fact. The secondary lines are set across two squares and thus are a basic 26.56 degree alignment which is not and never has been a wind direction. It is a draughtsman’s homage to the Portolan chart which has been drawn in the west, no more than a drawing exercise. To misinterpret is one thing, not to carry out the most basic research to ascertain what the lines are is a basic error which should not have been made by so experienced a researcher. This map, 1457, is fully investigated in my text ‘cg1457’ on this website. Yet again we can readily see that Pujades is a closed mind apropos the possibilities of reproduction. There is already the answer, a template in his text but it has not registered as the most likely candidate for the reproduction in a swift manner. My text ChPo3, ‘Leather, Vellum, Parchment,’ fully details the methodology. 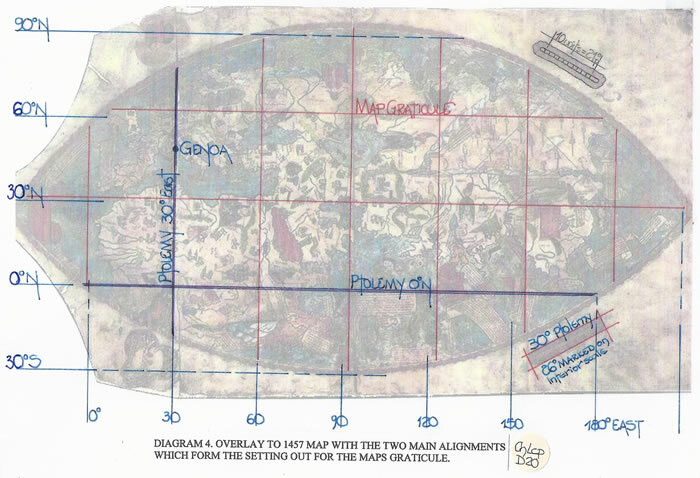 “Determining the scale of a Portolan chart (something which only to often has been carried out with a certain lack of stringency) is a task that poses numerous problems. If we assume that scale representations were based on proportional reduction of the real distances between two points, and we accept that medieval sailors were unable to gauge the distance separating two ports or geographical configurations with a minimum of vigour, since the information available to them was restricted to approximate estimates, it is absurd to attempt precisely to determine the numerical scale of a chart, because depending on the chosen points the result would vary considerably within the same work, so much, in fact, that the variation might easily exceed the average denominator by one million units or, which amounts to the same thing, reach over 20% in the Mediterranean basin”. Thus R J Pujades considers it absurd to attempt to precisely determine the numerical scale of a chart. But, as has been clearly shown the wind rose scale is also the scale of the chart and hence we have a second (or first) method of measurement, the graticule. Therefore although by choosing random measures across a chart which can be clearly assessed against the scale bar or cruciform scale, we can equally access the measures via the graticular units. Thus where Pujades states, “for each chart I give the approximate average size of one of its basic units represented on the scale (equivalent to 50 miles sub-divided into five 10-mile units) and those of five different, very deliberately chosen, crossings.”, we can measure each by the unit scale, measure the geographical distance and arrive at a mean value for each unit. As has been shown previously in this text the miles unit quoted by Pujades (and in contemporary texts i.e. de Canistris) have been shown to be a mis understanding of the distance measures. This is no doubt through the difficulty of ascertaining the unit length mentioned in a text, (See Andreas Biancho where he quotes 57.6 and 62.5 miles per degree, that is Arabic and Italian miles on one diagram), as the variation was considerable with no possible alignment. But via the overlay of a Portolan chart upon a Mercator chart (diagram ChlCpD21) with the Mediterranean Sea length equalised from the Pillars of Hercules to the Gulf of Issus we can show that what has been indicated is an acceptably accurate distance from Djerba Island to El Arisch which in turn can be used as a measurement check (one of many) for the charts scale. This of course is the same measurement already used to ascertain the graticule measures of 2 leagues per division. Thus by a clear methodology, rather than random choice of distances to be measured, that is ascertaining their veracity for utilisation by comparison the scale can be very accurately assessed. This of course then raises the question of where the accuracy came from in the first instance. Is it from the Roman period and their itinerary distances, their maps and charts, or it emanates from a later period of sailing by the Arabs and then the Normans? Questions, that at present cannot be answered by this text but are discussed in my ChPo3 text. In paragraph 5 R J Pujades quotes the Crescenzio chart copying method at the turn of the 16th to 17th century, but in Paragraph 6 he dismisses the methodology. In Paragraph 7 R J Pujades then discusses the pouncing method discussed by Crescenzio and likens it to a ceramist copying a chosen design by using a needle to punch holes through a design and then rubbing the surface with pounce chalk, charcoal or indigo to show the holes positions. We are now discussing clear practicality; work on a sheet of vellum not ceramic clay and my ChPo3 text clearly indicates the results. I have clearly shown that pouncing a vellum sheet after pricking through holes is most certainly not the ideal method. It requires numerous pricked holes large enough to hold grains of pounce and thus be seen; it requires that the cartographer then is so very careful not to gather the pounce from these holes as he uses a very fine quill and thus the line thickens and blobs; it requires that the ink does not flow into the holes and thus form a series of darker dots along the line particularly if it is a sepia line, which will be all to obvious to a researcher, and finally the number of holes to be pricked for a complicated coastline is out of all proportion to the simplicity of using a template. The method is fraught with difficulty and the text ChPo3 has a full explanation from a working model to indicate the problems highlighted. In paragraph 8 Pujades then discusses the document (a will); Pere Joan Pruners son of Vincenc Pruners received from his sister Maria half the chart models as his legacy. My text ChPo3 indicates that if they had been positive and negative templates or formers, both brother and sister would have been able to continue the business and produce equal charts. Suffice it to say this is a non controversial section indicating that when the toponyms are carefully studied they can be used to date Portolan Charts because of the introduction of new names as towns evolve. Unfortunately for Pujades he uses the Carta Pisana as an example, a chart he has not studied along with the Cortona chart, and in his 2012 paper bitterly regrets the fact as the two charts are re-dated at least a hundred years later and are thus not the earliest. That honour now falls to the work of Petrus Vesconte for extant charts. It must be abundantly clear to all that the fact that the scale bar was appended prior to the coastline being drawn is precisely because it was required to set out the wind graticule, the first lines to be drawn for a Portolan. In paragraph 3, R J Pujades mentions the Carta Pisana and the Cortona Chart scale which he considers represents 50 miles per division. He has as has been clearly shown mis- understood the scale. It is 10 units set in a 12 ½ unit circle, thus indicating a revision of the 35/30/27 unit scale for the graticule to 4/5ths size or 28/24/21.6 or 28/24/16/5.6 units. This is geometry at its finest, using a circle with an inset scale bar, ratio 4/5, and the scale bar is precise. R J Pujades then proceeds to quote Opicino de Canistris, 1338 text, where-in de Canistris tries to explain the scale bars in terms of miles, not leagues as my text indicates is correct and as already discussed, however for continuity it is here-in repeated. As can be readily seen from the figures this is a reworking of the wind rose graticule figures where the 7 plays a very important role. In paragraph 4, R J Pujades returns to the Vesconte 1311 chart and 1321 atlas where on we have seen the double cruciform scales set in a circle meaning measure in both cardinal directions and clearly set out the wind rose graticule prior to the chart. This concludes the sections for the wind network to the end of Chapter 4. R J Pujades commences (paragraphs 1 & 2) with, “As I mentioned earlier, one of the few indisputable certainties in the study of medieval nautical cartography is the fact that all finished works featured a network of 16 or 32 winds (as from the moment when the primitive network with quarter winds was introduced). Seamen made sure, as we have seen Cotrugli explain, that a chart’s bearings were correctly taken before purchasing it, because the winds it represented provided the means to determine the direction they had to follow. On the other hand, we have also seen that despite the fact that this network was traced out partially or totally before the coastline was drawn. In the process of obtaining copies it served no purpose other than, at most, a guide to the tracing procedure, so that the correct directional relationship was, maintained between the different ports on the map. Does this mean that the wind network played no role in the actual construction of the first graphic designs reproduced in nautical charts? I do not believe so, since it is one thing to deny the usefulness of the wind network as a basic pattern for obtaining new copies from a previously established model, but quite another to extend this conclusion to the initial moments of the configuration of the first models”. 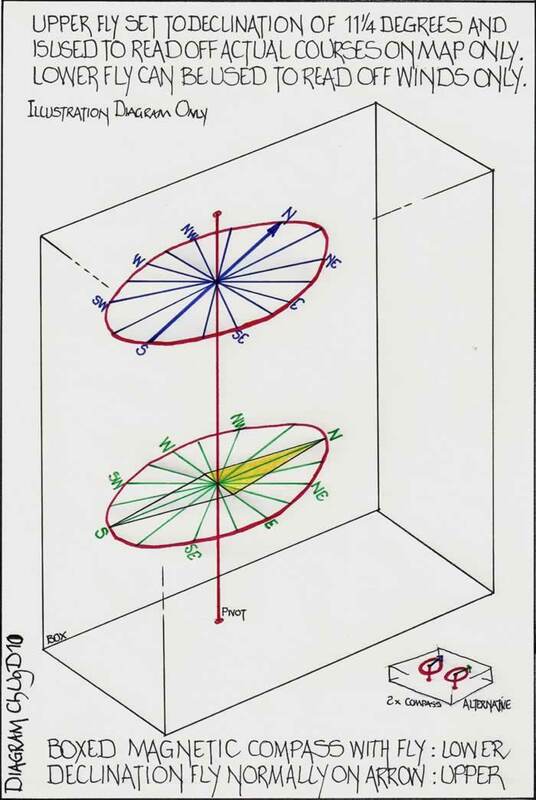 As has already been shown this text by R J Pujades is a complete misunderstanding of the wind rose graticule, its construction and usage in the preparation of the chart. By not investigating the graticule a whole theory has been evolved by R J Pujades which is a complete misinterpretation of the documentation available. In paragraph 3 he states that there is a deviation of 8 or 9 degrees from the Mediterranean axis for the ‘map’ and that the magnetic variation in 1300/1400 was to the east, but the Portolan chart’s deviation is to the west, that is in the opposite direction, counter clockwise. Diagrams ChlCpD13, ChlCpD14 and ChlCpD15, already exhibited are the main explanatory diagrams for this section of text. This is so simple to explain by a layout of the three protagonists; the magnetic north which is in effect 11.25 degrees East of North or one quarter wind; the wind rose graticule north which is in fact geographical north, as the winds can only blow from their geographical source, and the ‘map’ north which is 11.25 degrees west of the geographical north wind rose. Draw a plain map of the Mediterranean Sea, Meridional points or Mercator and then draw the 36N latitudinal line east west and the 15E longitudinal line north south. Now draw the 11.25 degree magnetic variation line from the central crossing point to the N by E. But note, obviously, the 15E longitudinal line is also the wind rose graticule north line. Now pivot move the magnetic north line which is 11.25 degrees east until it aligns to the geographical north line represented by the 15E line; that is magnetic north now aligns to wind north, but in so doing the whole ‘map’ pivots 11.25 degrees to the west and thus in the final analysis you have a Portolan Chart with Magnetic North and Wind North, which is also geographical North, aligned and the new ‘map’ north is 11.25 degrees west of north at N by W. But all you have achieved is to rotate the magnetic north joined to the ‘map within the Portolan’ which rotates exactly the same and are thus always set in the same juxtaposition to one another. Thus instead of creating a simple chart where the winds could be successfully used to accord with the new magnetic compass and its Fly attached one quarter wind askew we have the situation where the ‘map’ will always be one quarter wind adrift of the true winds position and hence probably useless as the mariners have no reconciliation line to use. Any mariner in the Mediterranean Sea basin would know where true north was to be found by observing the sun at midday and the shadow cast by a mast or similar. Any mariner worth his salt would look at the chart’s we are studying, library models, and realise that he sailed due north for certain routes, following the sun shadow at midday, the magnetic compass showed that its north was in fact N by E and the ‘maps’ north was N by W. That is a 22.5 degree deviation. The magnetic deviation could be overcome by the Fly being askew 11.25 degrees and thus it would agree with the wind graticule true or geographical north, but nothing will allow for the second deviation of a further 11.25 degrees to bring ‘map’ north back to the geographical wind rose graticule true north. They are contour each other! If the ‘map’ had been oriented as originally drawn to graticule north all would have been so very easy. Thus to even infer these mariners were not capable of realising the discrepancy between magnetic and true or geographical north is nonsense and thus Pujades statement, “mariners at that time were ignorant of the physical phenomenon of magnetic variation, and for this very reason they amassed direction data provided by uncorrected compasses. These directions deviated some 9 degrees eastwards from true ones, but since they did not know this, they transferred them to a perfect geometrical system, represented by the wind network, as if they were absolutely correct. In this way they located upon the true geometrical north of their diagram of 16 directions what was in fact a direction that deviated some 9 degrees towards the east, thereby proportionately distorting all other directions, was in fact, due to magnetic variation, WNW-ESE, as we see in the figure Explanation of the cause of Counter-clockwise Deviation of Directions, (see page 320)”. The diagram on page 320 of course does not explain anything; it is merely an artifice to show how the magnetic north can by a Fly be made to agree with true or geographic north. 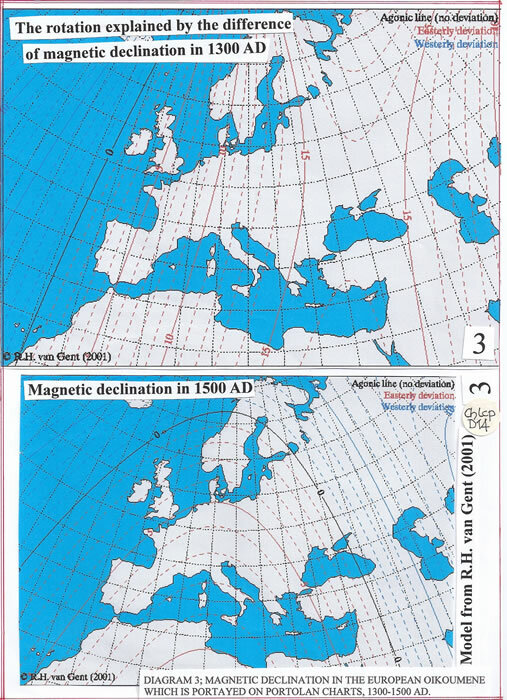 It does not and cannot explain why the ‘map’ is turned to the west as it fails to show that the map must originally have been drawn correctly in agreement with the wind rose graticule and is then twisted to the west as the correction of the magnetic declination is made. The wind rose graticule is the prime arbiter of the Portolan Chart. The drawing of the graticule is controlled by the scale bar, that self same scale bar that is the inset maps scale. Thus the graticule is of prime import for all aspects of the charts construction; it cannot be omitted as it is the progenitor of the chart. The fact that it could be used for other purposes, as R J Pujades suggests, copying being one, is a by product of its supreme importance. 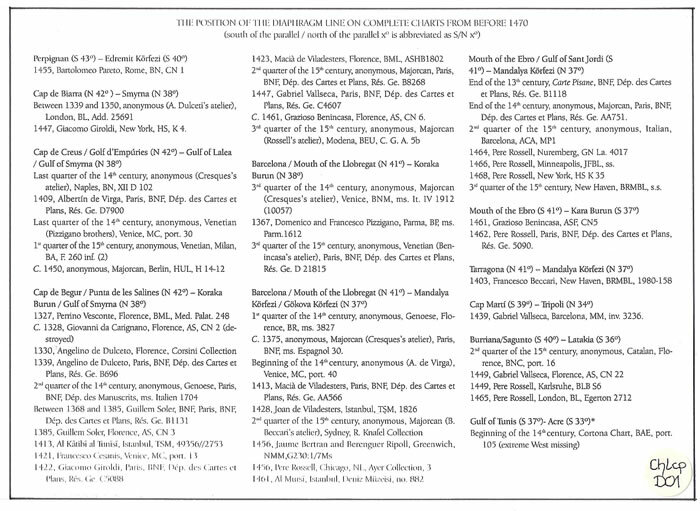 I therefore consider the text contained within pages 473/481 and 513/514 of Les Cartes Portolanes should be re-appraised not only in the light of the re-dating of the Carta Pisana and Cortona Charts, which are no longer the first exemplars, but mostly in light of the foregoing research which clearly shows a total neglect of the evidence here-in presented, known about, but ignored. 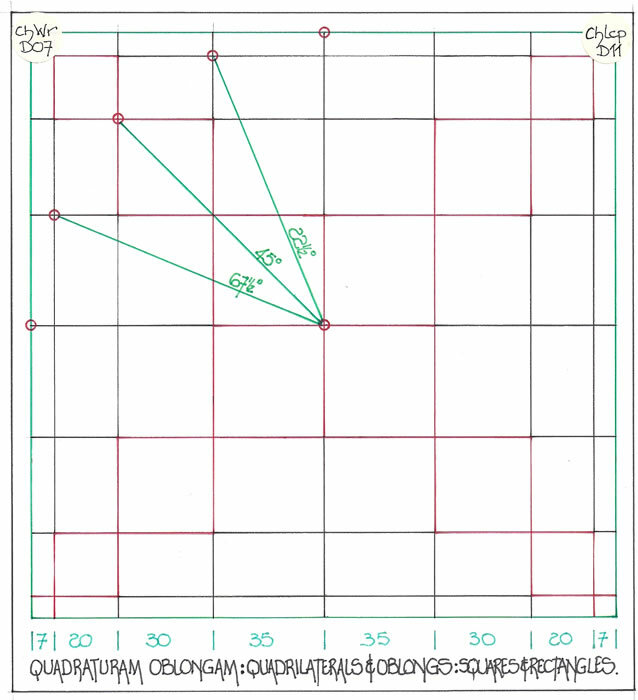 The Graticule is the primary agent for Portolan Chart design and construction. It is impossible to align a magnetic compass to a Portolan Chart; the chart must be aligned by twisting or skewing clockwise to meet the magnetic alignment. Had this been done then it would have automatically shown previous researchers that the Wind Rose was no longer geographically oriented and could not be used with the magnetic compass Fly north, but had to be used with the magnetic compass arrow. That would require a separate Fly aligned to the magnetic arrow to read off the wind direction as Diagram ChUgD10 illustrates. Firstly, had the designer cartographer of the premier Portolan chart not tried to align the magnetic compass arrow to the wind rose north and at the same time pivoted the ‘map within the Portolan’ by the same amount, thus merely maintaining the relationship between the magnetic compass and the map, the problems of wind rose north would not have occurred. It was unnecessary and thus although it has produced a visually attractive chart, it would have served mariners better by an aligned map and wind rose. Secondly, previous researchers, by constantly drawing diagrams in their papers precisely as a Portolan Chart is presented, and then applying a “symbolic” magnetic compass to the Portolan Chart, have through their methodology not determined the actual actions necessary to align the magnetic compass which has led to a fundamental misunderstanding. Finally, it would be prudent for all researchers of any facet of the Portolan Charts to reconsider their texts in the light of the foregoing research so that future students and researchers are equipped with the actuality of these charts and not part researched text. The chart has been subjected to an investigation regarding the putative geographical graticules as it was used by J Alves Gaspar in a text and the chart was there-in subjected to analysis by the MapAnalyst system. This produced a series of flowing curved lines which of course do not appear on a Portolan Chart. They are constructed from straight lines and a foursquare Windrose. Thus it was necessary to ascertain the precise geographical graticule which was hidden inside the Portolan Chart. This proved that Angelino Dulcert was quite aware of magnetic declination as he used three variants along the Mediterranean length. The diagram ChlCpD09 clearly shows the variation, something which the MapAnalyst plot does not as it clearly uses the graph layout of curved lines joining all points. 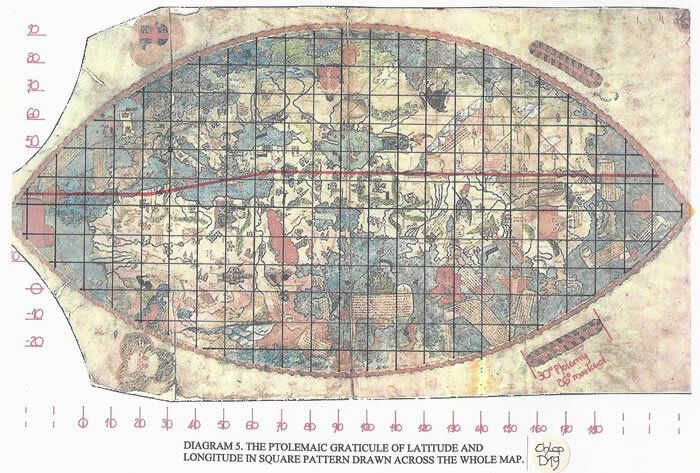 Alves Gaspar, J, 2008, dead Reckoning and Magnetic declination: Unveiling the Mystery of Portolan Charts. e-Perimetron, Volume 3 No 4, 2008, pp191-203. Lanman, J T, On the Origin of Portolan Charts, The Herman Dunlap Smith Center for the History of Cartography, Occasional Publication No 2, The Newberry library, 1987. Encyclopaedia Britannica, 1911, Volume 17, pages 641/642. Vesconte and Dulceto chart diagrams. Yale University Library, Beinecke Library, Ms. 557: Benedetto COTRUGLI, De navigatione, 1664 f. 62 r/v. 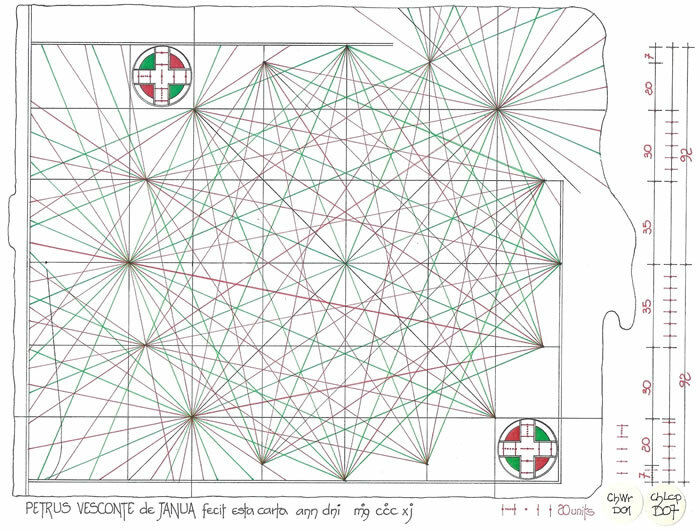 Falchetta, Piero,2007, The Use of Portolan Charts in European Navigation during the Middle ages. Patrick Gautier Dalche, 2001, Cartes marines, representation du littoral et perdeption de l’espace au Moyen Age. Castrum 7, 1996 Rome 2001. Parry, JH, 1964, The Age of Reconnaissance, Weidenfeld and Nicolson, London. Ferrar MJ, 2012, 1457 World Map; Genoese, Yes! Draughtsmanship before History. See this website for text.